For the last day of our exciting road trip in Madhya Pradesh, we had in our itinerary three places to visit namely Nachna, Tigawa and Bhedaghat. We started from Khajuraho early in the morning so we could cover all the three within our time limit. We reached Nachna which is home to two beautiful temples built between 5-7th century, our first destination for the day. Though reaching Nachna was not at all difficult, there was something special about this place probably owing to its remoteness. After a final enquiry at the village of Nachna, we were directed to this temple complex. The Chaumukhanath Temple is an old temple dedicated to Lord Shiva and built during the reign of the Prathihara dynasty. It is datable to the post Gupta period around 7th century AD and is regarded as one of the earliest temples built by the Prathiharas. The sanctum houses a very beautiful four faced Shiva linga (chaumukha). The four manifestations of Lord Shiva depicted on the four directions are as follows: facing east is Tatpurusha (three eyed and represents the air element); facing north is Vamadeva (expresses feminine qualities and represents the water element); facing south is Aghora (expresses wrath with bulging eyes, raised nostrils and a widely opened mouth and represents the fire element); and facing west is Sadyojata (expresses calm and serene qualities and represents the earth element). The shrine is square in plan with a porch in the front and has a covered ambulatory path pierced by perforated windows (Jali). The porch in its front seems to be a later addition. The Jali windows are exquisitely carved with depictions of musicians and dancers, and river goddesses Ganga and Yamuna on either sides. The shikara is plain and simple with an amalaka and kalasha at its top. The Parvati Temple is datable to the late Gupta period around 5th century AD. The temple has a square grabhagriha and probably housed a small square chamber above it. The sanctum is devoid of any idol. The entrance of the sanctum carries ornate floral designs and is flanked by river goddesses Ganga and Yamuna at its lower portion. The inner band of the doorway shows carvings of tendrils emerging from the navel of dwarfs on either sides and the outer band carries images of mithunas (amorous couples). The lintel bears the carving of Vinadhara Shiva in the center with Parvati along with various attendants and vidhyadharas (semi-gods) on their either sides.The outer walls of the temple have perforated Jalis with the depiction of Lord Ganesha, musicians and dancers. There are many ruins of pillars and other portions of the temple lying besides the temple in the open. On one such pillar are seen images of Lord Varaha, Lord Narasimha, Lord Trivikrama and a defaced image probably of Lord Parashurama. 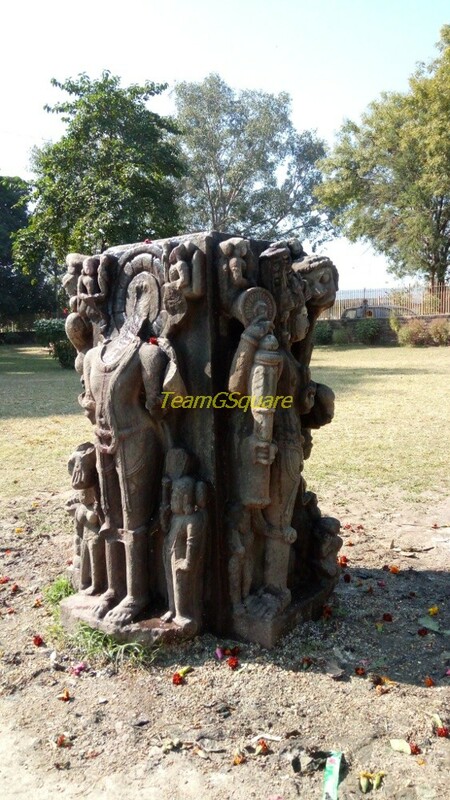 Also seen around is an old shivalinga placed now under the shade of a tree and a widow panel. How to reach Nachna: From Khajuraho - Panna - Devendra Nagar take right towards Saleha - Take Right turn here and a Left turn to reach Nachna, about 100 Km from Khajuraho. Superb images, the Hindu scuptures tells more about life. Lovely temples. Thanks for sharing these hidden gems. These are some wonderful sculptures. Thanks for sharing this.